The BrahMos Aerospace Private Limited is a joint venture between the Defence Research and Development Organization (DRDO) of India and the Federal State Unitary Enterprise NPO Mashinostroyenia (NPOM) of Russia under BrahMos Aerospace. The BrahMos missile is named after two rivers, the Brahmaputra and the Moskva.. A latest Govt. 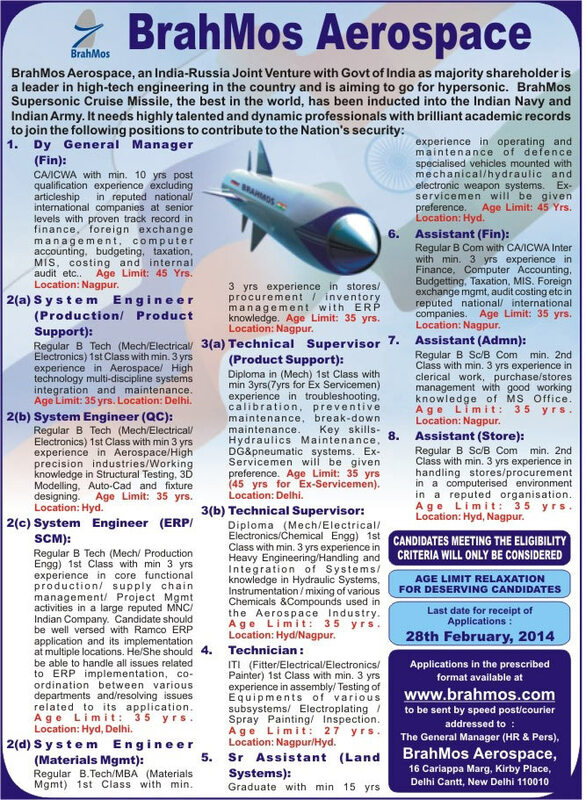 job notification has been issued by the BrahMos Aerospace and welcomes the application form for the highly talented and dynamic professionals with brilliant academic records to join the various posts like Dy General Manager (Fin), System Engineer, Technical Supervisor, Technician, Senior Assistant and Assistant posts. Candidates willing to apply should be send their complete details on an prescribed application form before the last date. Applicant must have degree in CA/ICWA with min. 10 years post qualification experience for Dy General Manager post, Regular B.Tech 1st Class with min. 3 years experience for the System Engineer posts, Diploma in (Mech) 1st Class with min 3 years for the post of Technical Supervisor, ITI (Fitter/ Electrical/Electronics/ Painter) 1st Class with min. 3 years experience for the post of Technician, Graduate with min. 15 years experience for the post of Senior Assistant and regular B.Sc /B.Com min. 2nd Class with min. 3 years experience for the post of Assistant form a Govt. recognized University / Institution. Age should be in between 17 years to 45 years maximum varies as per the post requirment. Upper age relaxation as per the Govt rules.